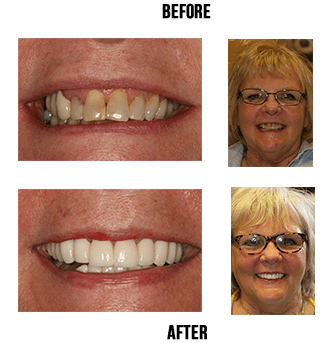 The veneer procedure will start with tooth preparation—a step which involves removing the discolored or unsightly portion of the tooth and shaping the tooth in preparation for veneer placement. The second step is to take an impression of the prepared teeth—this will be sent to the lab so that your veneers may be crafted. A temporary restoration will be provided while patients wait for their new prosthetic. Once the veneers are created, patients will return so that the restoration placement can be completed. The veneers will be fitted comfortably into your mouth so that your new teeth feel completely natural. Once placed, the final treatment step involves bonding the new veneers, leaving you with a beautifully restored smile. Our dental experts ensure that your new veneers will be constructed of the most durable porcelain materials available—resulting in a beautiful smile. Visit Crane Family Dentistry today and see if the veneer treatment can get you the results you want.